This sunny, 3-bedroom home is on a wooded acre that provides privacy and tranquility. A path leading to a private beach in the Wellfleet Harbor is just across the street. This convenient beach is ideal for sailing, boating, or just watching the sunset. The beautiful National Seashore beaches (3-4 mi) and freshwater ponds (1-2 mi) are a 5 min drive away. Wellfleet village, with its many art galleries, is a 15 min. stroll along the shore and over Uncle Tim’s Bridge. The house has a fully equipped kitchen that opens into a spacious living room. Two 11’ x 14’ bedrooms with queen beds and ceiling fans are on the main level. A third 14’x 16’ bedroom with a queen bed is in the finished lower level, adjacent to the playroom which has a trundle bed (2 single beds). 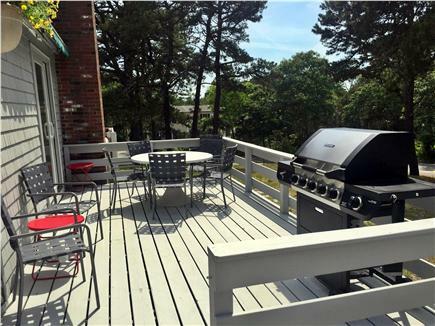 The outdoor deck is equipped with a gas grill and is the perfect spot to relax after a day at the beach. An ideal Cape Cod rental! We have enjoyed annual vacations in this comfortable home for over ten years. The house is ideally located in a private setting on a quiet secluded street close to Wellfleet Harbor. The street has nearby walking access to the harbor, and along the picturesque waterfront over Uncle Tim's Bridge to charming Wellfleet Village. The spacious open kitchen and living area is tastefully updated and well equipped with plenty of room for our family to relax and enjoy great meals. One of the two decks is directly off the kitchen equipped with a gas grill, table and chairs, and awning; which is great for outdoor dining. The second deck is at the rear of the house along the wraparound driveway, which is a perfect spot for adults to relax and watch kids play and ride bikes after a day at the beach. 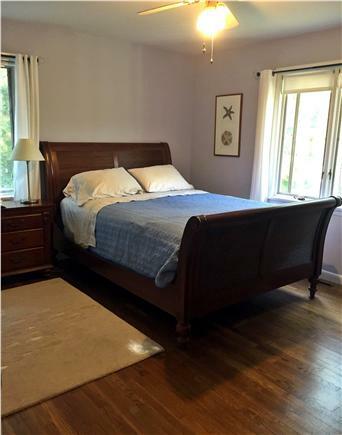 This house is an ideal setting to enjoy all there is in the Wellfleet area. It was a great find when we first rented back in 2002, and we continue to return summer after summer. We love staying at this house and definitely recommend it as a vacation location. We've rented this house many times over the years and love it. It's very well maintained and nicely updated -- very comfortable. The third bedroom is a finished basement that is nice and cool for kids. The location is the best thing about it, though: a nice 10 minute walk to Uncle Tim's Bridge and the galleries/restaurants, etc. beyond. Owners great to deal with too. Good value.